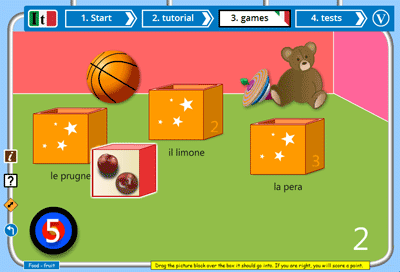 In this game we are in a room with lots of toys - and the room needs clearing up - you need to put the play blocks back in the right boxes to tidy the room and win the game...but which is the right box for each block? Well, you can work that out by comparing the picture on the block with the Italian writing beneath each of the boxes - you should drag the block into the box whose Italian text matches the picture. This game reinforces the Italian you learned or revised in the lesson by asking you to match each picture to the correct word or phrase. If you are older you may not like the childish reference to toys, but don't worry - there are other games to play and who knows - you might like a trip down memory lane? Beneath each box is a Italian word or phrase.